Imagine a child… flailing about in a tantrum on the floor. He knows not why he is so angry. He has a warm and dry place to dwell. Food to eat, rarely canned peas. A mother (fathers being close to obsolete these days). But the anger must be assuaged. Bernie and Trump are ready for mindless expressions of macho appetite. But Bernie actually admits his love of the all for one and one for allism that caused many times more deaths of innocents than Hitler’s Nazis. Trump is just wacky and can be excused (hopefully never to return). On second thought, bring us Trump. With enemies like his, he’s gotta be good. No founding father ever had a good thing to say about democracy. They intended to design a republic, not a democracy. The candidacy of Bernie Sanders presents an opportunity to examine democratic socialism. It is extremely important because vast quantities of millennials (not all of them) are belching forth from schools with the same ideas that Hans formed while at UNI. They flock to Bernie events like Beatles concerts. When you get old, time goes faster. It allows you to see trends more clearly. The trend is toward the worship of government as the provider of all things and away from self-sufficiency. Venezuela voted for it, and it is incredibly timely that Bernie is pushing for the same system here. The fact overlooked most often by promoters of socialism is that, while youthful idealism might inspire us to work to promote the common good for a while, the need for food and shelter enter the picture soon and cause a change of heart. All this free stuff has to come from somewhere. Hugo Chavez, after being democratically elected in Venezuela, expropriated 1,200 farms and companies in an effort to fund his benevolent programs, even giving away houses. If you wanted to start or expand a business, with the ever-present threat that the government could seize it for the common good, would you? On an interview show on public radio (Fresh Air with Terry Gross) the subject of the Venezuelan catastrophe was repeatedly referred to as being caused by falling oil prices. The New York Times reporter interviewed, who lives in Caracas, glossed over the fact that the entrepreneurial climate in Venezuela had been destroyed by socialism. It was interesting to hear a resident of Caracas give first- hand accounts of the long lines, empty shelves, and hunger, but never relate it to Venezuela’s “business friendliness” ranking by the World Bank as 186th out of 189. Apparently his paycheck from New York City sets him apart from the victims of socialism in Caracas. I implore any millennials who might read this to consider the consequences of a democratic socialist system. Also, conservatives should consider the benefits of privately run and funded businesses they have traditionally accepted as things that needed to be done by government; such as the nation building, space exploration, and medical research mentioned above. Thomas Jefferson said government will inevitably grow. I now see that the federalist idea is what was intended as a way to impede socialism. But starting with Lincoln’s war, then Johnson’s Great Society and Civil Rights Act, our property is no longer ours to use as we see fit. States as well, have no ability to compete, or should I say they only compete through subsidies and tax breaks (plainly more socialism). So the democracy we now suffer under is still offered as a solution to the problems created by democracy. The vote, as a means to circumvent limited government, worked in Venezuela and it will work here if we let it. 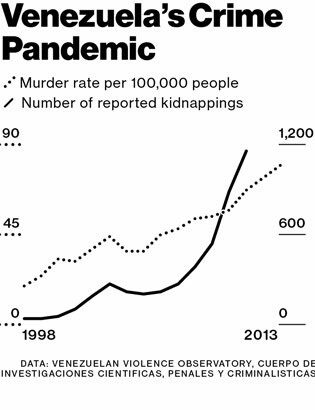 Venezuela has the highest murder rate in the world.